I have been meaning to post about fairyland for sooooo long! And I just remembered that today is International Fairy Day! So, do you want to see a totally magical fairy neighborhood?? OF COURSE YOU DO!! 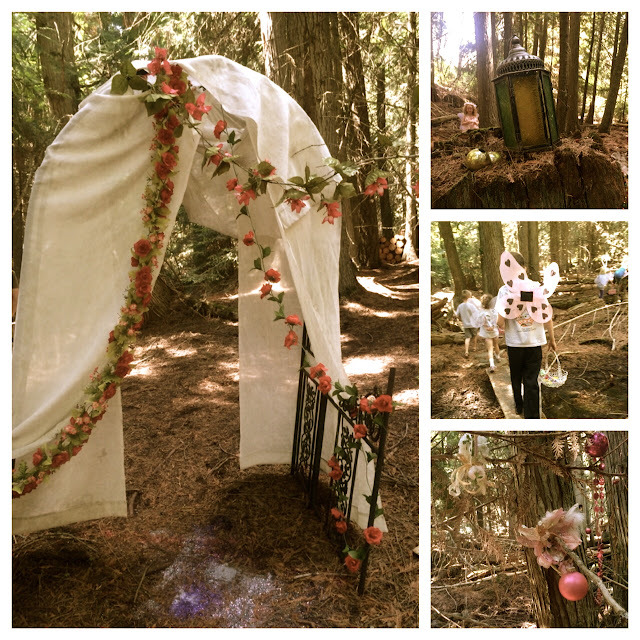 My friend has a gorgeous wooded area nearby her house and she is some sort of magician with creating childhood delight!! You see, she's decorated the woods and made it a haven for fairies and you'll never guess what happened! Fairies moved in!! Now tons of fairies live in her wood. They come out for the children to see them, but they hold very very still…they don't want the adults to see them moving! When you enter fairyland, you sprinkle fairy dust at the entrance to tell the fairies thank you for allowing the visit. It seems the fairies love visitors because they leave notes and gifts for the kids to find. They also make the most delicious flower juice and tiny fairy cakes. It's seriously fantastic! Along with the fairies though, trolls also moved into the woods! They can be tricky little fellows, but they'll leave you alone as long as you drop some treasure along the path. Our recent trip to fairyland for our little friend's birthday was the first time Cuteness has been-- at least the first time she's been old enough to remember and actually enjoy it. She was in Heaven!! She's already planning a fairy party for her birthday next year…oh dear!